The Vikings might have disagreed, but there’s much to be said for approaching Orkney by plane. After the expanse of northern Scotland, the islands – 70 of them, 20 inhabited – fan out beneath you like lily pads, green and fertile, fields of crops and cattle running right down to the sea. That is if you arrive in the light. This time I was travelling in midwinter and we made our descent through blackness. My friends, John and Morag, were waiting to meet me. Chatting as we drove back to their farmhouse in Quoyloo I was reminded of how shrill and gushing I sound this far north. Orcadians are understated. They use words like “wonderful”, “marvellous” and “beautiful” sparingly, and their speech is lilting and gentle. A cow is a “coo”, just is “cheust”, and a baby (or bairn) is not small but “peedie”. 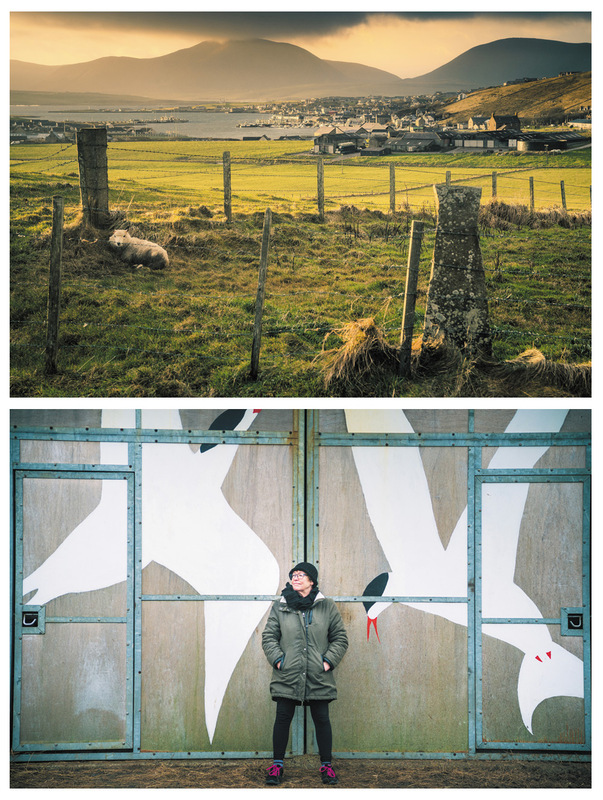 I first came to Orkney in 1992, to interview the poet George Mackay Brown. It was early June and the islands were spilling over with light. As my bus trundled between the capital, Kirkwall, and Brown’s home town, Stromness, I had a strange sense of homecoming, as if this was a place I’d always known. After the interview, I borrowed a bike – mainland Orkney is low and easy to get about. Everywhere I went there was evidence of a great sweep of time, from neolithic standing stones to concrete bunkers left by soldiers defending Scapa Flow in the second world war. 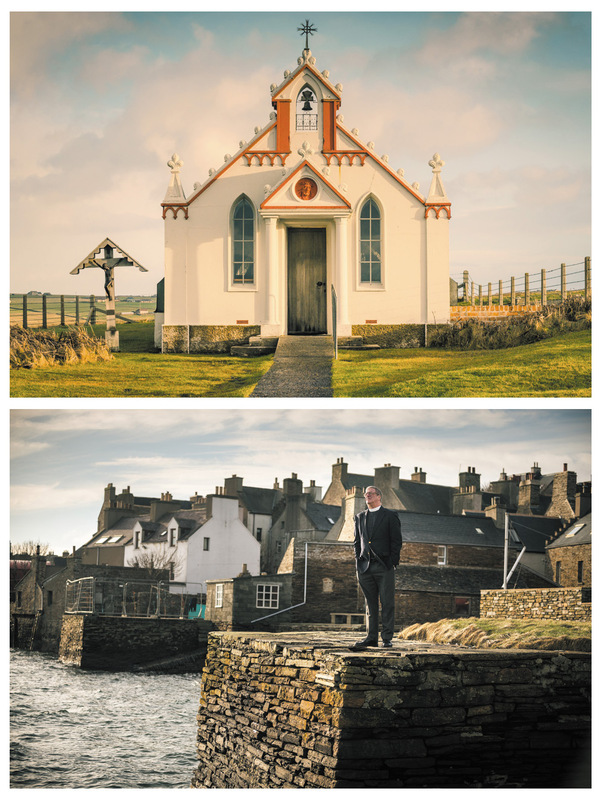 In Kirkwall, I visited Britain’s most northerly cathedral – “the light of the north” – built from red sandstone by Durham masons in the 12th century, in honour of Orkney’s saint, Magnus, martyred on Egilsay in 1117. Walking between its massive pillars was like moving through a pink forest. 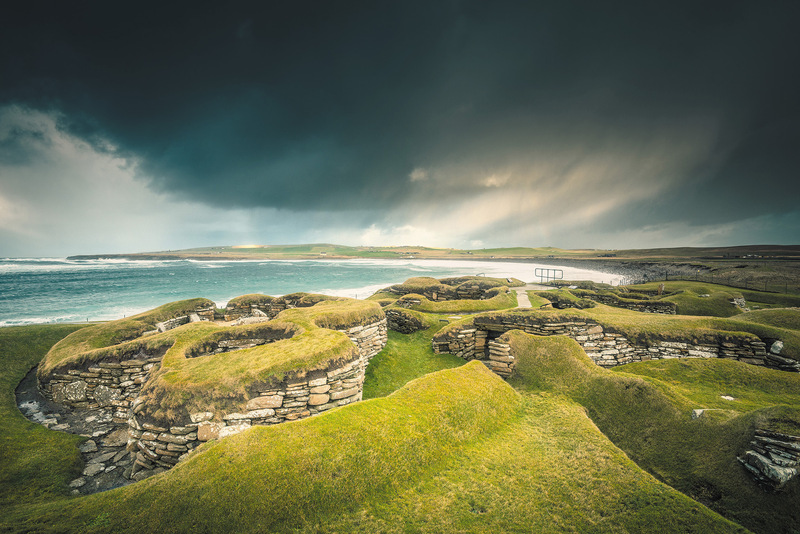 The neolithic village of Skara Brae was covered by a dune until 1850. 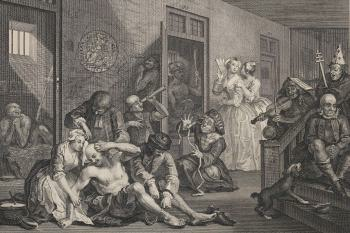 I returned to London resolved to visit often, and have done so; but I have only once before been in January. Orkney in midwinter is not, on the face of it, a welcoming place. In Stromness, the shops have put away their postcards and the museum is closed. For most of the five days I was there, a gale howled across the islands and planes and ferries were cancelled. The sun rose after breakfast, and set again mid-afternoon. No wonder many Orcadians suffer from their own particular brand of depression, Morbus Orcadensis, as they wait for the light to return. Yet there are reasons to revel in the darkness. “I love it that in the winter you cannot refathom the summer,” says Pam Beasant, who moved to Stromness 31 years go, aged 23. “And in the summer you can’t imagine the winter.” Some Orcadians find the relentless light of the summer more unnerving than the winter dark. “Autumn has come, thank God,” Mackay Brown wrote in 1969. “That hot summer nearly drove me mad. I was in that particular emotional state when every day the sun probed my wounds like a long golden spear.” The winter night skies often swarm with stars – and, though I have never seen them, with the northern lights. 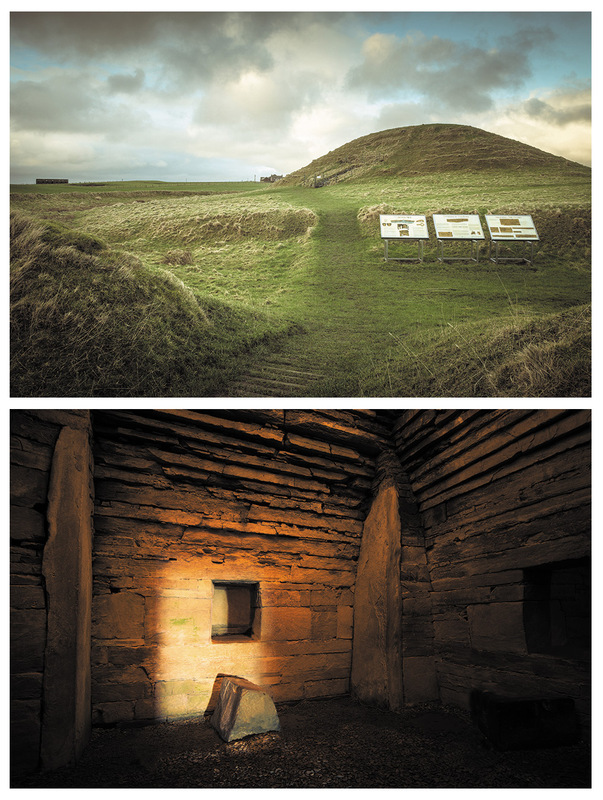 TOP The tomb at Maeshowe. TOP Looking towards the town of Stromness. In the summer tourists are crammed into Orkney’s neolithic sights, but on a Friday afternoon in mid-January I am the only one buying a ticket for Skara Brae. Dressed in waterproofs and looking like a cross between a traffic warden and a lifeboatman, my guide, Rob, leads me from the warmth of the gift shop (Viking helmets, whisky) into stinging horizontal hail. 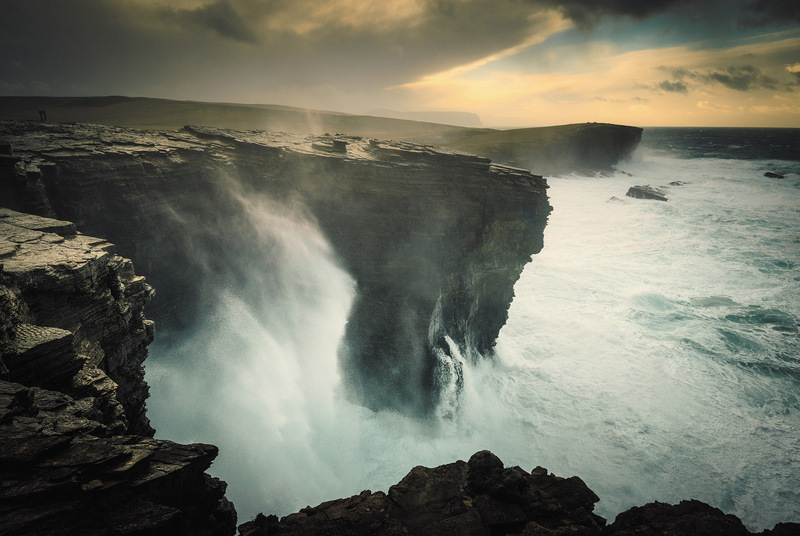 One night in 1850, Orkney was swept by a violent storm. The wind ripped the grass from a high dune by the Bay of Skaill on the west coast, revealing an almost perfectly preserved neolithic village. We wander through the small round houses, fitted out with stone dressers, stone cupboards, stone box beds – in which neolithic Orcadians are thought to have slept sitting upright, to prevent chest infections. Rob points out lavatories, connected to a central drainage system, and a stone-and-pole mechanism for bolting doors (strange, I think: 5,000 years on, most Orcadians wouldn’t think of locking their doors). That night hail turned to snow, and the following day Maeshowe, the hummocky chambered tomb where Orcadians laid their dead long before the first pyramids were built in Egypt, looked like a giant igloo. Crude in appearance, it is sophisticated in construction. For a fortnight either side of the winter solstice, as darkness falls, the setting sun throws a shaft of light down the low entrance passageway and into the centre of the tomb: a promise of renewal after death, and a message of hope across five millennia. My guide, Ellie, who moved to Orkney after studying archaeology at Reading – “the best thing I ever did” – points at Maes­howe’s elaborately corbelled roof, and the graffiti scratched on to the walls by Vikings who broke into the tomb to shelter over Christmas 1153. Then she turns off her torch. A finger of light is feeling its way towards us, and within minutes there is a splash of gold on the far wall. “That’s the best I’ve seen all winter,” says Ellie. 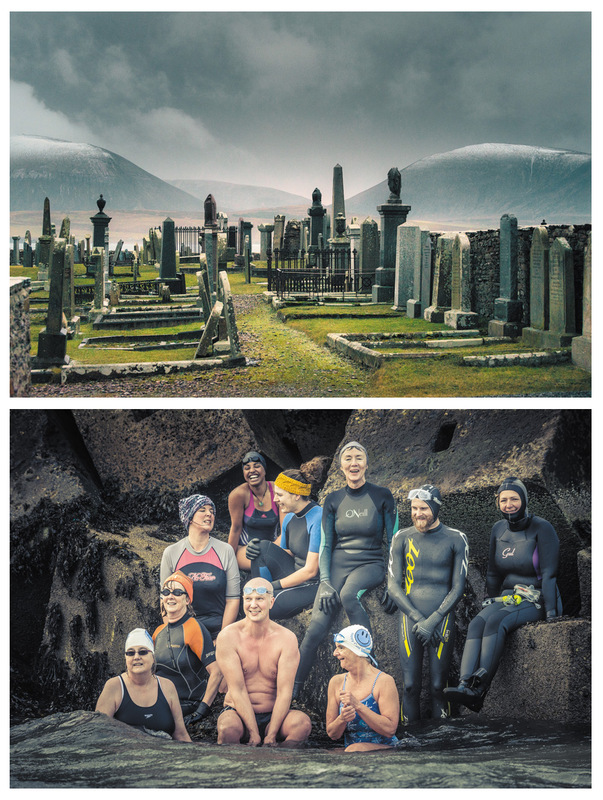 Before coming north, I’d been in touch with the Orkney Polar Bears – around 30 women (mostly) who meet to swim in the sea every day of the year. Helen Clarke, who co-founded the Bears six years ago, invited me to meet them one morning at a beach called Inganess. I drove into Kirkwall, past the “Otters Crossing” sign and the cathedral, and out the other side. When I arrived at our meeting spot the wind ripped the car door out of my hand. The water temperature was 42 degrees. Dipping in my fingers, it felt gaspingly cold. Sitting in their driving seats, Helen and Beatrice wriggled into swimsuits, sauntered calmly into the sea, then swam, laughing and chatting, for ten minutes. In the fug of a café afterwards, they explained why they do it: “It cured me of post-natal depression”; “It puts you right in the ‘now’.” But no native Orcadian has been tempted. For thousands of years the sea has provided them with food and jobs, but it can also claim lives. “The widow maker”, they once called it. They don’t tempt fate. All the time I was in Orkney, I longed to get to Hoy – in Norse the “high island” – whose mountains, the Cuilags, rise out of the sea a mile south of Stromness. It is the only place I have ever heard seals singing – a low, plangent moan. But the ferry was cancelled, and I could only imagine myself there. Two summers ago I had spent my 50th birthday in the great sea valley of Rackwick, where Mackay Brown wrote much of his poetry and Peter Maxwell Davies lived and composed. It was a hot, cloudless day, and three generations of family picnicked and dipped in and out of the sea, returning to Stromness sunburnt and happy. On days like that I wonder whether I could live in Orkney. Peering through the window of Robertsons, the estate agent in Stromness, I calculate that I could exchange my terraced house in Hammersmith for a fine sea captain’s house with panoramic views, and have enough left over to live on for the rest of my life. But the reasons I’d move here are not materialistic. I love the drama of the weather. In London if you wake up under a saucepan-lid sky it tends to sit above you all day. 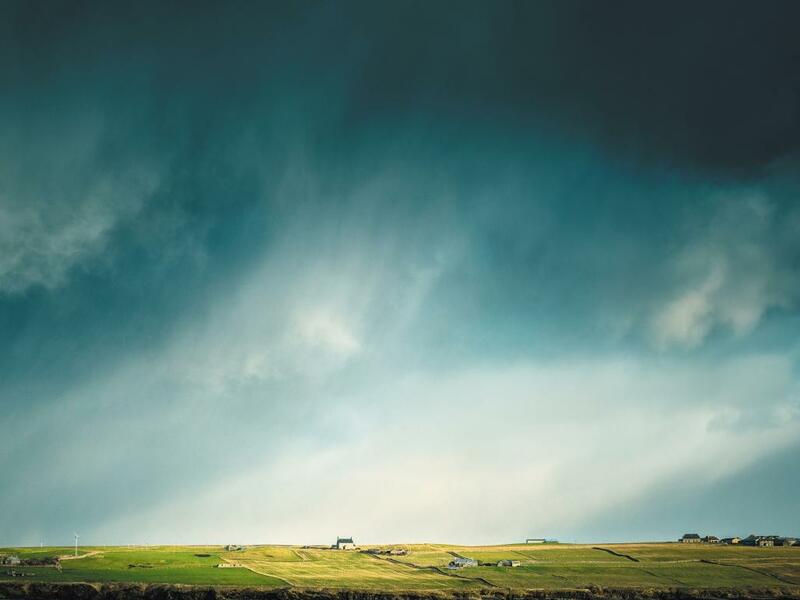 In Orkney the weather is constantly changing. Visiting Mackay Brown’s grave in the kirkyard at Warbeth, I watched snow clouds emptying themselves over Hoy, while the headstones around me were illuminated by early spring light. I love the fact that Orkney is as classless a society as anywhere I’ve been. And I love the pace of life. In Quoyloo there is a little shop packed with every­thing you might need for island living: tins of soup, neeps and tatties, candles, rat traps. Sometimes a girl with Down’s syndrome helps at the till. It makes shopping slow, but nobody minds. TOP Warbeth kirkyard, final resting place of George Mackay Brown. TOP The Italian chapel on Lamb Holm was built and decorated by Italian prisoners-of-war between 1942 and 1945. But anyone who has lived in Orkney for any length of time is wary of romanticising life there. 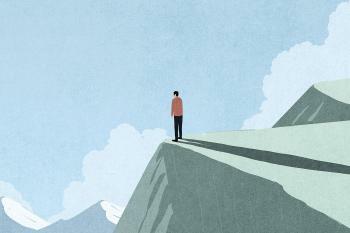 “Quite often people come hoping to rid themselves of demons,” says Pam. “But Orkney is a challenging place to live.” She is not the only person I meet who mutters darkly about alcoholism, domestic violence, suicide. Her son Tom, 25, has four contemporaries who have taken their lives. One, she says, drove his car over the cliffs at Yesnaby. On the way back to Morag’s, I take a detour to Yesnaby. When the wind is in the west, it is pounded by magnificent, terrifying waves. Near the cliff edge is a bunker, on the side of which the Samaritans have posted up a plea: “TALK TO US”. How does it really feel to be lonely? Is it time to reconsider the asylum?